Pelvic, Bladder, IC, IBS, Endo, SIJ Pain? Please say that Joey Giggles sent you! Elizabeth, 46: Pain for 30+ years. Bladder, bowel, pelvic & sexual pain; Endo diagnosed at age 30 Testimonial: "PainShield MD is nothing short of a miracle - reduced my pain up to 80%." "It has reduced my bowel, pelvic, bladder and sexual pain." "It causes my intestinal system to function with an even steady movement, which reduces my [bowel] pain." "I have reduced my medications that make my intestinal function worse." "I am able once again to sleep through a full night"
In a clinical study, PainShield MD reduced pelvic, bladder, urination, lower back, sexual and bowel pain associated with adhesions, interstitial cystitis, IBS, pelvic muscle spasm and the aftermath of hysterectomy. 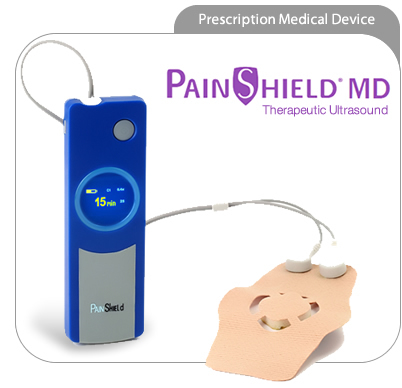 PainShield MD is a drug-free, non-invasive therapy you can wear discretely under your clothing, at home, at work, even during sleep, to get hours and hours of pain relief. It is an an alternative to expensive and risky hysterectomy or neurostimulation implant with Interstim® for pain. Before having surgery or implantation for your pelvic, bladder and GI pain, try PainShield MD.